For Immediate Release: Posted On 6/22/2009 By Industrial Magnetics, Inc. The new "BasicLift" magnet manufactured by Industrial Magnetics, Inc. is a powerful, no frills permanent ceramic lift magnet perfect for basic, flat steel lifting applications. 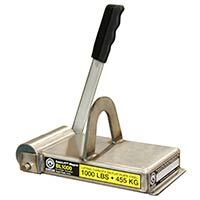 Featuring a lightweight and durable Stainless Steel design, the BasicLift has a full width cam to release the magnet from the steel surface and a tall lift lug for easy use with crane hooks and slings. The BasicLift offers a good value for your dollar with strong lifting capacity and basic lifting features including; full width cam release, large lift lug, light- weight design, durable Stainless Steel casing, heat resistantance up to 300°F and a 2:1 Design Factor. Available in 3 models with lift capacities of 400, 1000 & 1500 lbs.